Kill Shot Bravo is a stunning fixed screen shoot ‘em up from Hothead games. It’s far from the usual stuff and has splendid visuals. Enemies run, stumble, and panic at the sound of gunshot and even escape the scene if there’s a delay of a few seconds. Snipers are merciless and will hunt you down with their laser rifles. Bullet time is brilliant to say the least. You can rotate the camera to get a 360 degree view of the bullet traveling through air and hitting your enemy. There’s also a new game where players fight the undead to contain a virus outbreak. 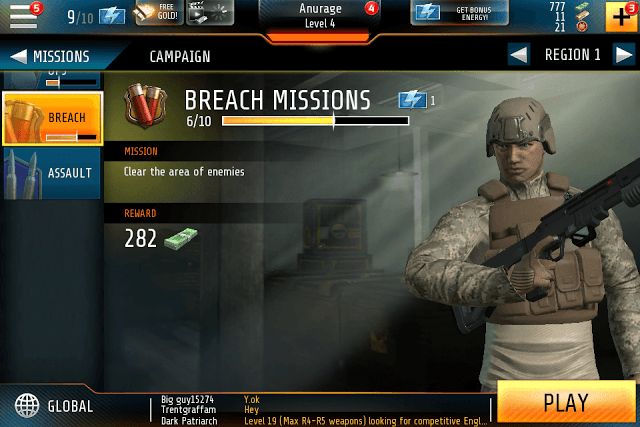 Besides Assault missions, Breach missions are also a great way to earn extra bucks. These missions require a shotgun. These close combat missions are easier to complete, provided you upgrade your weapon to meet mission requirements. After blowing up the door and breaking in, the game gets into slow-mo mode for a few seconds. This will help you aim and shoot at enemies, even kill one of them. Purchase “Hand to Hand” perk to increase the slow down time in breach missions. This perk is available under “Gear”. Don’t forget to equip it. (More about perks later). Look out for men armed with knives. They will rush at you and stab you mercilessly. Thankfully, time will slow down when you confront one. Take advantage of this and eliminate before a knife man comes too close to you. Look at the scope meter. The more it fills up, the closer you are to your target’s location. A fully filled up meter will turn the scope symbol (eye) into blue. Upgrade your sniper rifle’s zoom level and accuracy to find and eliminate rival sniper. Upgrade your rifle’s barrel and and ammo improve range and damage respectively. If your opponent is looking at you through his sniper’s scope, you will notice a small flash of light. Make sure you have upgraded your rifle’s sights to spot one quickly. Medals can not only be used to purchase special gear, but also perks, which are made available to players in the Gear section. Perks bestow additional attack and defense boosts. There are different types of perks, such as “Armor”, which reduces enemy damage by 15 percent; Close Call, where enemy snipers may miss you; Hand-to-Hand, which increases the close-quarters slow down time and many more. You can buy a random perk with medals. After buying a perk, make sure you equip them. Tap on a perk and select a slot to equip it. You will need to increase gear rating to unlock a slot. Buying new gear using medals increases your gear rating. You will get medals by using a Facebook friend or an alliance member in a mission. Using higher-level Facebook friends in primary and assault missions will help you win missions faster and you may receive more medals. Complete achievements. Keep an eye on the achievements section under menu to know your rewards. Take alliance members with you on assault missions. Players not only receive a medal for bringing an alliance member to battle, but also receive one as victory rewards. Helping your alliance in bounty events and other missions. Try playing common bounties to take down enemy targets faster and earn kill rewards. Check your inbox for medal rewards. Help Facebook friends in their missions. Look for Daily Mission rewards and try to complete missions that give medals as completion prizes. You can replay a daily mission if you fail to beat it. In several campaign missions, enemy snipers will be lurking somewhere. And if alerted will snipe you down in seconds. Using an auto-spotter can help you locate a sniper. The auto-spotter will tag the sniper for easy identification. However, auto-spotters don’t come for free (although you may get them as rewards if you complete “Daily Missions”), so a better option would be to take a Facebook friend or an alliance member with you for spotting support. Just join and alliance and a member will automatically join you. He may spot hidden snipers and other enemies, making it easier for you to take them out one by one. Using alliance members/Facebook friends or helping them will also earn you medals, which can be used to purchase gear. Aim for explosives. Drag the zoom slider up and then aim at an explosive barrel to get a pin-point accurate shot. Enemies will be stationed closer to explosives and blowing up one will kill multiple enemies at once. Look for snipers. Their laser targets indicate that they are nearby. Follow the laser beam and take down snipers first. A single shot will kill you, so your first priority is to eliminate snipers first. If you get killed by a sniper, it’s game over. 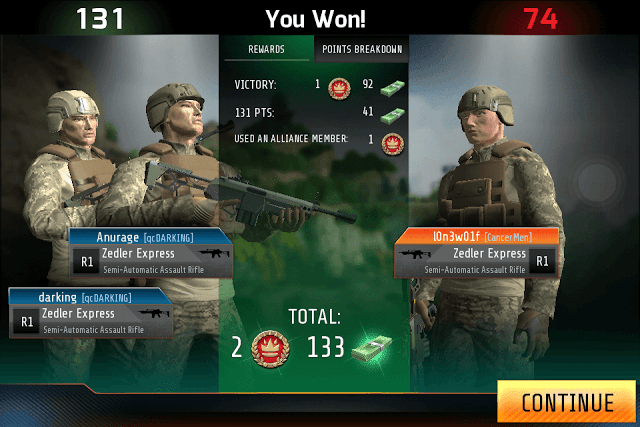 However, if your score is higher than your opponent’s score at that moment, then you are declared the winner of the assault mission. You will get extra points for head shots, long distance kills, multiple kills and V.I.P kills. Points are awarded for accuracy, but you don’t have much time to pull off an accurate shot. Just go for body shots and eliminate as many enemies you want. Join an alliance and a member will join you in your mission to beat your opponent’s score. You will receive medals for using an alliance member. You can also take a Facebook friend with you to assault missions. After zooming in on your enemy, use the left thumb to adjust scope. If the enemy isn’t moving, press and hold the screen to keep aim stable and then press the shoot button with your right thumb. Keep your right thumb above the fire button and when you find the right spot using your left thumb, press it quickly to eliminate your enemy. Using both thumbs can help you get a stable aim. You will hardly miss your target and have a stable aim. With an alliance member accompanying you, you can easily beat your opponent’s score. Join an alliance that’s open to the public and does not have any requirements and then start playing assault missions to earn extra cash. Your ally will help you get rid of enemies, which will drastically improve your score and you will receive more points. Keep an eye on “Daily Rewards”. 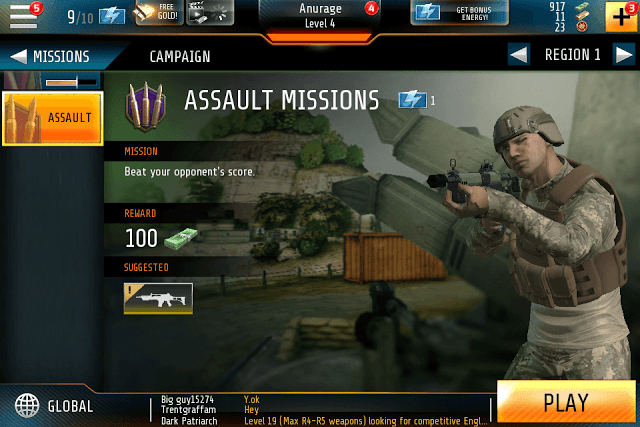 A number will appear above the Daily Reward screen indicating that a mission is available for you. Complete daily rewards to earn medals, armor piercing bullets, spotters, slow-mos etc. Use thermal to find explosives on grenade men. If you shoot at the right spot, a grenadier will explode, killing anyone near him. Make sure you upgrade your rifle as per mission requirements. However, you can skip the upgrade requirements by tapping on the proceed button. Missions that allow you to skip an upgrade requirement might be completed, although it can be tough to eliminate enemies without proper upgrades. The Slo-Mo power-up can be extremely useful to pin down running enemies. There will be missions that will have the main target running from one end to the other. You will have to eliminate him before he escapes. Here, the slow mo power-up slows the time down, making it easier for you to kill him with a single shot. Slo-mo costs real money, but you can get it by completing daily missions. Check your Inbox for rewards. It can be found under menu, just beside the Friends section. This is where you will receive medals for helping out alliance members and Facebook friends in their assault and primary missions. You will need to play a bounty mission multiple times in order to reduce the key target’s health to zero. You will have to eliminate him before the timer runs out, else the target will escape. Join a big alliance and find common bounty missions and make sure you and your alliance members reduce the enemy’s health as fast as possible.